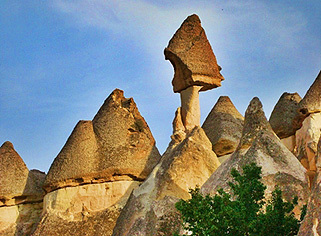 At 09.30-10.00 depending on the arrival time of the participants visit to Devrent Valley where various types of fairy chimneys are abundant. We will walk through this amazing valley. Thereafter visit Pasabagi (Monk's Valley) with multiple stems and caps, peculiar to this area. After visiting Pasabagi, drive to Avanos which is known for the pottery, a craft dating back to the Hittite period. The red clay which is worked by local craftsmen comes from the residue in the Kizilirmak river, the longest river of Turkey. Further to the time for lunch proceed to Goreme Open Air Museum (Dark Church is excluded; entrance requires additional admission fee) to visit the churches, chapels and monasteries carved into the fairy chimneys from the 10th to the 13th centuries with frescos painted on the walls. Thereafter time to take photos in the neighboring valleys. Shopping time for the well-known merits of the area before returning to the airport. Transfer to Kayseri or Nevsehir Airport and the evening flight to Istanbul. After 75 minutes of flight you will be at the Istanbul Airport.